The La Mirada Girls Soccer Team celebrates after their win over Moorpark. 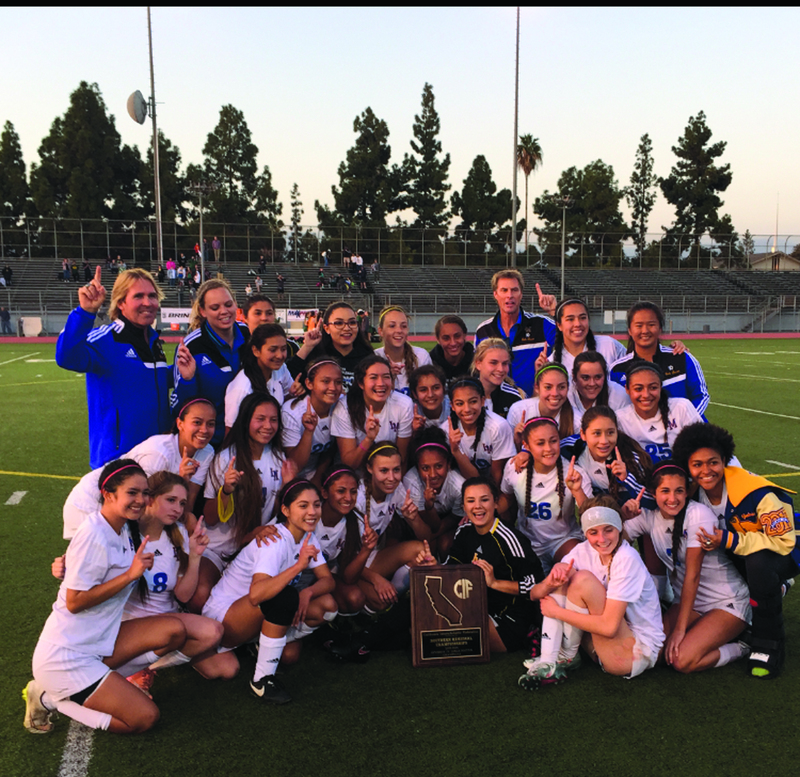 The La Mirada High School girls soccer team capped a triumphant season, capturing its first state championship after a thrilling 1-0 victory over Moorpark in the CIF Southern California Division IV final on Saturday at LMHS. Freshman Megan Day scored the game’s solitary goal and junior goalkeeper Melissa Torres had another stellar game in the net, leading the Matadores to their 18th consecutive win to finish the season. Just two weeks before, the Matadores won their second straight CIF Southern Section championship, also besting Coastal Canyon League rival Moorpark in the final. La Mirada’s victory was even more rewarding after being eliminated in the semifinal round of last year’s state playoffs. This year, led by seniors Maddie Bennett and Amanda Duran, the Matadores became an unstoppable force, staying focused on and off the field. “Winners dream big dreams. At first they seem impossible, then they seem improbable, then when you summon the will, they seem inevitable,” La Mirada girls soccer coach Dave Christensen said. La Mirada’s triumph continues a red-hot streak for the high school’s athletic department. Both La Mirada’s football and boys basketball teams captured state championships in 2015.